The first series of experiments conducted at the European XFEL have begun with the participation of technology developed at the School of Engineering at the University of Seville. The Flow Focusing technology (also known as GDVN, Gas Dynamic Virtual Nozzle), has been one of the key elements in the success of the first experiments carried out by the European XFEL project, the greatest source of x-rays in the world today. It is a tool that was created and developed by the Fluid Mechanics teacher Alfonso Gañán Calvo, of the Higher Technical School of Engineering at the University of Seville. This technology, which has been used for the study of microscopic biological samples, places the University of Seville among the institutions at the global vanguard in the used of XFEL (X-Ray Free-Electron Laser). The fundamental advance obtained in the European XFEL project is the increase in the amount of data that can be obtained per second in the analysis of a sample. This achievement is possible thanks to the use of a frequency of pulses that had not been used before, more than a megahertz. For that, a high rate of renewal is necessary – that is to say, that each pulse has clean samples, not affected by the previous pulse. Therefore, they have to be given sufficient velocity. “This means photographing or “hunting” the molecules using an ultra-rapid, and ultra-powerful, flash, before the samples disintegrate due to the intensity of the ionising radiation that they receive”, Gañán explains. The biological samples (normally protein microcrystals) have to be in an aqueous environment. The challenge has been to present them in the correct way for them to be intercepted by x-ray pulses that are scarcely a few microns in diameter and last for less than ten femtoseconds (a hundredth of one thousand billionth of a second), and to generate the clearest and most coherent diffraction pattern possible. To this end, the GDVN technology has been capable of generating jets of liquid of less than 2.5 microns in diameter (1 micron = one thousandth of a millimetre) with speeds that reach 100 metres per second (260 km per hour), enough to transmit protein microcrystals and continually renew them at the point of impact without them being affected by the previous pulses. This has been achieved thanks to the use of helium as the a focusing gas for the micro-jet, as helium, due to its physical properties, acquires expansion speeds three times greater than those of air. In addition, an extraordinarily precise method of nano-fabrication has been used (3D nano-printing) for the device that emits the jet. 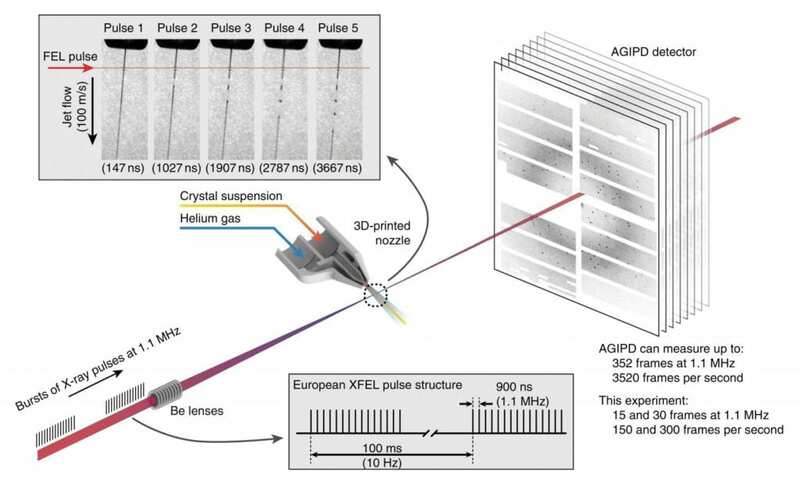 The combination of XFEL technology (trains of ultra-short and ultra-powerful x-ray pulses) with the Flow Focusing vehicle (GDVN) has given rise to what is now known as ‘Serial Femtosecond Crystallography’ (SFX), a revolution in molecular biology. GDVN technology has been adopted as the most efficient, robust and reproducible (standard) method for the introduction of samples for Serial Femtosecond Crystallography (SFX) y time-resolved SFX at the European XFEL (Hamburg, Germany), SACLA (Japan), LCLS (Stanford, USA), SwissFEL (Zürich, Switzerland), and the newly constructed Chinese and Korean XFELs, among others. The European XFEL has been a pioneer in this regard, followed by LINAC LCLS III, which is still not operative. With this frequency, the so-called “impact index” is maximised. This measures the percentage of samples that are effectively intercepted by the x-ray. The scientific review Nature Communications has published an article which has presented the principal advances.